With the help of a local consultant, Whitworth University reduced its waste by 70 percent over a period of months. Erik Makinson will literally dive through your dumpster to help you find out just how much money you're wasting. That's how he helped Whitworth University's food service provider, Sodexo, figure out they were throwing out $15,000 a year in soup alone. With data analysis and trash weigh-ins, they also learned things like a single serving of scrambled eggs, while beautiful on the plate, contained five eggs. "Nobody needs to eat five eggs for breakfast, but you don't realize until you dive that deep into the data, into the waste stream," says Makinson, who founded Resource Synergy to help clients like Whitworth become more sustainable while saving money. With Makinson's help this year, the university reduced its waste by 70 percent in just months, diverting much of the 1,000 pounds of campus food waste per day to compost, reducing trash pickups from weekly to every other month as needed, saving thousands in trash hauling and billing mistakes, and netting the university the higher education Recycler of the Year award from the Washington State Recycling Association last month. And that's just one of the 80 or so clients and hundreds of businesses Makinson has worked with since starting Resource Synergy in 2015. 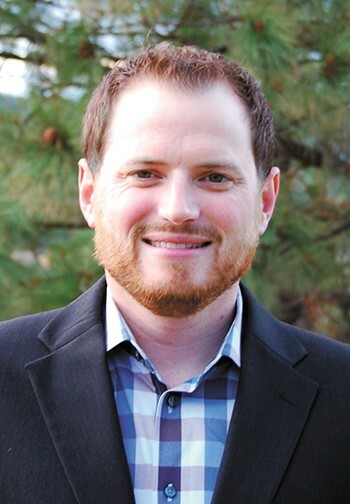 At the time, he was a consultant with Engie (then Encova), a Spokane-based business that helps major companies, usually with 100 or more locations, find ways to reduce energy use and be more environmentally friendly. On his way to work, Makinson would regularly drive past downtown Spokane buildings and notice they only had dumpsters out back, with no recycling in sight. To him, that was a shame. Recycling isn't just a feel-good exercise or good for sustainability purposes — it can seriously save businesses money. "Of course this bothered me from an environmental standpoint, but also from the standpoint of a business person, because recycling in Spokane is about a quarter of the price of trash disposal," he says. "These buildings were literally throwing money away." It wasn't cost-effective for Engie to work with individual businesses or buildings, so Makinson started Resource Synergy to bring high-level recycling and waste expertise to a smaller, local scale. Three years in, he's helped deliver recycling bins to 8,000 individual office desks in the region, and his clients have increased their recycling by 2 million pounds per year — enough to fill a double stacked freight train two-thirds of a mile long, Makinson says. And his work is not only saving thousands for private entities, but filling in gaps in the recycling system left by major state funding cuts. In recent years, the city of Spokane and Spokane County offices that oversee waste management and recycling have seen funding for educational resources and staffing slashed. 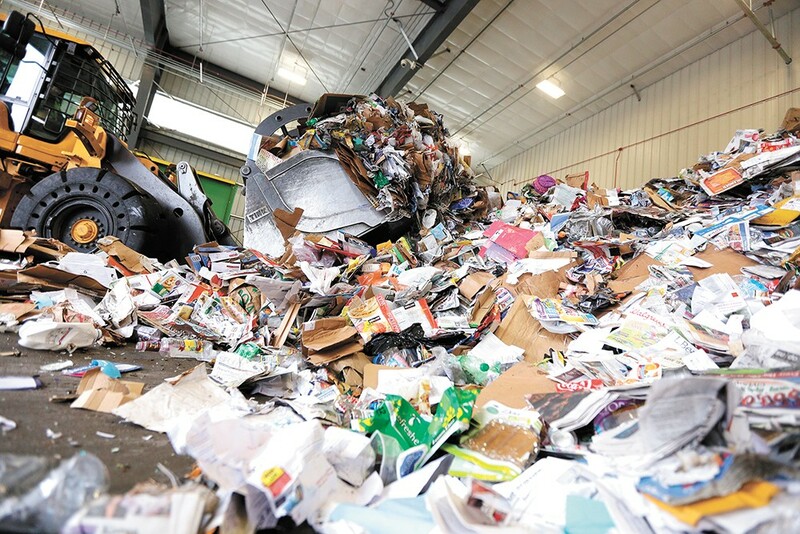 The Department of Ecology helps county and local offices pay for recycling and waste education — think advertisements, printouts, school presentations, classes — as well as things like no-charge household hazardous waste disposal sites, through the Local Solid Waste Financial Assistance grant program. But while $28.2 million was allocated in 2013 to 2015, that dropped to $10 million statewide for the 2017-19 capital budget, leaving little wiggle room for places like Spokane and Spokane County to offer any extra services or expertise. "We're trying to stretch our resources," says Deb Geiger, the Spokane County Regional Solid Waste Coordinator. "Erik has been kind of a boon for the community because with the cuts in the funding from the state, we can't concentrate, we don't have enough staff to reach out to the businesses and serve them the way they need to be served. He fills that niche pretty well." Kris Major, the city's solid waste education coordinator, who the county also contracts with, says that ideally, the city would have a separate recycling coordinator on staff to help answer more questions and provide expertise to people who want to improve their waste processes. She has to wear that hat right now, too, and while she can do some limited consulting with businesses as requested, breaking it down to return on investment isn't necessarily her area of expertise. "I can still do that consulting. ... I can talk best practices, show them costs, but I haven't jumped into a dumpster and done the full-on audits and been able to break things down," Major says. "When you look at the number of businesses or commercial accounts in the county and potential volume of recyclables that could be diverted from the waste stream, that is very significant." Interestingly, what Makinson has found for businesses and locations that aren't recycling yet is not that there is a lack of awareness or desire to reduce waste or recycle more, but usually a lack of manpower. "It comes down to the simple fact that everybody already has at least one full-time job, and in many cases they have more than one," he says. "What I've found is unless four components exist, a program won't go forward: those are time, knowledge, capital and motivation. They need to know what to do, need to have the time to do it, need to have the motivation to do it, and then they need to have money available to buy things as simple as recycling bins." With the offices he's worked with, such as Kiemle and Hagood commercial properties, just helping coordinate the renting or purchase of recycling bins and item pickup has saved major money. "We have 36 buildings Erik works on with us, and across those buildings we've saved about $173,000 in refuse costs," says Gordon Hester, director of commercial management for Kiemle and Hagood. "The savings have been phenomenal. I think we were all a little stunned at how much money we were throwing away." In addition to the other savings at Whitworth, Makinson helped find about $30,000 in overbilling charges that the university was able to mostly recoup from its garbage hauler, says Chris Eichorst, Whitworth facility services director. "What I've really valued with Erik and his team is just their expertise in the industry," Eichorst says. While the company started out in waste and recycling, Makinson says he's already looking ahead to the types of consulting they can provide on water and energy-efficiency services, and he's been in talks with local leaders about how to attract businesses to the area that can help create a "circular economy." The kinds of things to look for, he says, are where the waste from one business is a necessary ingredient for another, so if they're sited close together, it can create jobs and reduce costs for everyone. His passion is driven by a love of the outdoors and natural environment, but Makinson also says he genuinely enjoys helping businesses succeed. The original print version of this article was headlined "Trash to Treasure"